With rugged desert terrain, poor soil conditions, very little fresh water, an extremely harsh climate, and a very small population, the Negev Desert was largely ignored in the first forty years of Israel’s modern-day existence. Because of that, several large portions of this area may have been given away in 1947-48 when the borders of Israel were being reestablished had it not been for the vision and support of people like Israel’s first Prime Minister, David Ben-Gurion. Ben-Gurion stood resolute in his conviction that the Negev would someday blossom and rejoice as Isaiah prophesied in ancient times. “The wilderness and the wasteland shall be glad for them, and the desert shall rejoice and blossom as the rose…”—Isaiah 35. Israel’s Negev Desert, though once considered uninhabitable, is awakening to the prophetic words of Isaiah and Ben-Gurion. Although the Negev Desert comprises nearly 60 percent of Israel’s modern-day landmass, only and estimated 8.1 percent of Israeli citizens live there. But today, a present generation of Israelis—farmers, ranchers, scientists, accountants, business owners, and more—are beginning to make a change… as the desert is literally beginning to bloom and grow, with the help of people like you! 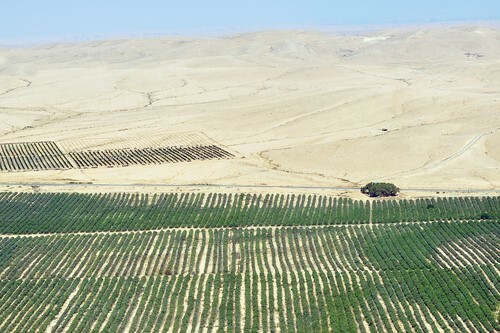 Planting and cultivating previously uninhabited areas in the Negev, on the border with Gaza, growing olive trees, and grapevines are considered a daunting task. However, My Olive Tree, in cooperation with the Israeli Defense Forces (IDF), has recently established a program that is aimed at developing the Negev Desert. At My Olive Tree, we are committed to turning the sand of the Negev Desert into blossoms of new beginnings for many generations to come. The IDF supplies the water, and My Olive Tree ensures that the proceeds from the harvest of the olives will help lone soldiers and other humanitarian aid projects within the IDF. It’s a beautiful partnership to be able to fulfill what God said through Amos about planting olive trees and grapevines in the desert, and what God said through Isaiah about the desert blooming like a rose. We are planting olive trees and grapevines in the Negev because we can make a difference. We are doing our best, and we are trusting that you are going to do your best to help fulfill these prophecies. For more information about the many ways that you can help, please visit www.MyOliveTree.com. Thank you!